After finishing Fawlty Towers, John Cleese set to making a string of feature-length comedies, each with varying degrees of success. This week’s movie recommendation is the finest of those efforts, for which he earned an Academy Award for his screenplay co-written with Charles Crichton: A Fish Called Wanda (1988). A gang of four criminals pulls off a near-perfect diamond heist. Only one witness and hefty doses of internecine mistrust survive the crime. Unfortunately, neither of these problems is as easily surmountable as the gang members had planned. On one hand, Michael Palin plays Ken, the animal loving getaway driver with an inveterate stutter who is tasked with eliminating that pesky witness. However, each of his attempts to silence the lady is stymied by her protective entourage of pet dogs that he desperately wants to leave unharmed. 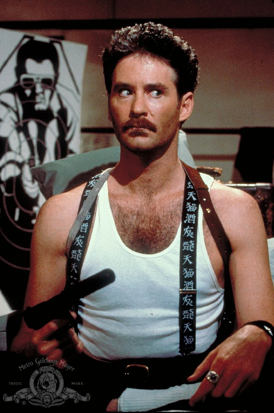 On the other hand, the mistrust between the other three members of the gang is even less tractable: Kevin Kline plays Otto, the trigger-happy American with a loud mouth, an insecurity about his intelligence, and an unshakeable contempt for Englishmen; Jamie Lee Curtis plays Wanda, the nubile and manipulative con artist; and Tom Georgeson plays the gang’s leader George. After the heist, Otto and Wanda double-cross George and land him in jail to maximize their share of the loot. However, the double-cross doesn’t work out to plan, as George has executed a double-cross of his own, by hiding the stash before he’s nicked. 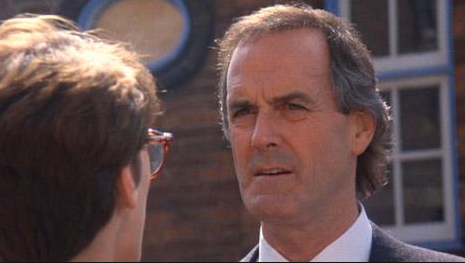 Wanda therefore befriends George’s barrister Archie (played by John Cleese), in an effort to discover whatever information George has chosen to divulge about the diamonds’ possible whereabouts to his counsel. As the rest of the film plays out, Archie develops a forbidden and exciting connection to Wanda that provides a welcome reprieve from the stuffy and restrictive upper-middle class English lifestyle to which he’s become inured. As far as heist films go, the premise of this one is fairly straightforward. Criminals steal diamonds, but can’t trust one another enough to make off with the winnings. However, the joke of the film isn’t really about the heist as much as it is about what happens when English propriety (read: pomposity) meets American forthrightness (read: obnoxiousness). The heist is nothing more than a vehicle to propel Cleese’s comedy of manners forward. The script deftly hops from one low-brow joke to another, but the experience doesn’t feel as though it’s descended into a wearisome sequence of toilet humor gags – this remains one of Cleese’s gifts – instead, the prevailing sentiment is that low-brow humor is itself bearing the brunt of the joke. The worst parts of English and American mannerisms are on show, and yet no-one watching the film ends the experience feeling too severely chastened by the experience. It’s light hearted fun.